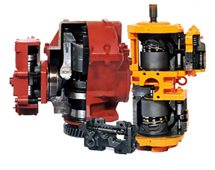 Eaton’s Vickers PVH high flow, high performance pumps are a family of variable displacement, inline piston units that incorporate the proven design, quality manufacturing techniques and operating features of other Vickers piston pumps, but in a smaller, lighter package. The PVH series has been specially designed to meet the 250 bar (3625 psi) continuous duty performance requirements of new generation equipment designs. These are efficient, reliable pumps, with a selection of optional controls for maximum operational flexibility. Designed specifically for strenuous application, they provide the productivity gains and controllability improvements desired in earthmoving, construction, machine tool, plastics, and all other energy- conscious markets. 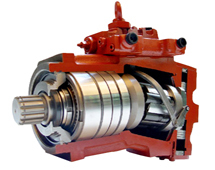 As with all Eaton products, these pumps have been fully laboratory tested and field proven. – Versatile design includes single pumps, thru-drive arrangements, and a variety of drive shaft and control options that will adapt to any application and provide the most cost effective installation. – Proven components designed into a heavy duty, compact housing to provide 250 bar (3625 psi) continuous operating performance, and 280 bar (4050 psi) operating performance in a load sensing system. 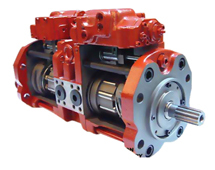 This design assures long life at the higher performance levels required of today’s power-dense machinery. – Compact and lightweight design to reduce the application weight, and provide better access for installation and servicing. – Service kits developed for the most critical rotating and control components to simplify and assure successful pump servicing. – Quiet designs available for noise-sensitive industrial applications, reducing sound levels further to provide a more acceptable environment. – Designed for maximum efficiency in any type of application. A variety of compensators provide the most effective system control, and the 95%-plus volumetric efficiency means more flow, and more input energy, is directed to the work and not into heat and waste. 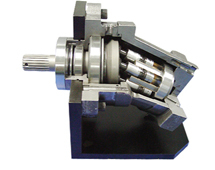 – Heavy duty bearings and shafts result in minimum internal deflections and wear, providing for longer life and maximum uptime. Use anti-wear hydraulic oil, or automotive type crankcase oil (designations SC, SD, SE or SF) per SAE J183 FEB80. Select a viscosity grade that will allow optimum viscosity, between 40 cSt (180 SUS) and 16cSt (80 SUS), to be achieved. Cold start capability at 5000 cSt. Maximum intermittent temp, 104° C (220° F). “Vickers Guide to Systemic Contamination Control,” available from your local Vickers distributor or by contacting Vickers, Incorporated. Recommendations on filtration and the selection of products to control fluid condition are included in 561. Recommended cleanliness levels, using petroleum oil under common conditions, are based on the highest fluid pressure levels in the system and are coded in the chart below. Fluids other than petroleum, severe service cycles or temperature extremes are cause for adjustment of these cleanliness codes. See Vickers publication 561 for exact details. Vickers products, as any opponents, will operate with apparent satisfaction in fluids with higher cleanliness codes than those described. Other manufacturers will often recommend levels above those specified. Experience has shown, however, that life of any hydraulic components is shortened in fluids with higher cleanliness codes than those listed below. These codes have been proven to provide a long trouble-free service life for the products shown, regardless of the manufacturer. 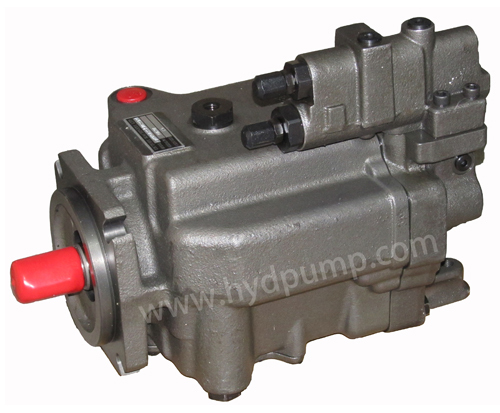 Order PVH pump by the full model designation. 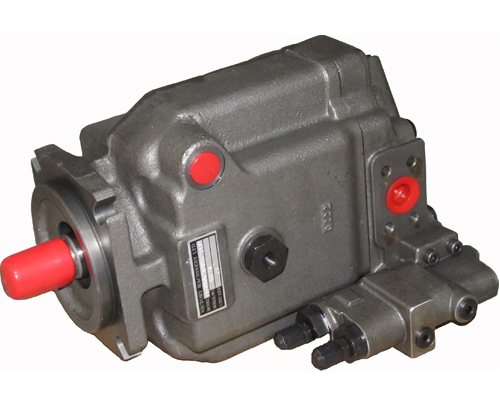 Pump displacement, mounting flange type, direction of rotation, pump configuration, shaft end type, shaft seals, pressure adjustment range, specific control functions, and torque limiter settings are all specified in the full model code.